If ever you’re in Hangzhou, the capital of China’s Zhejiang province, and hear someone saying, “Yeah man, the food nice,” don’t be surprised. They had probably just licked their chops at Cho-Cho, the Jamaican restaurant opened by Atlanta businessman Glendon Thompson, in July 2007. Jamaica-born Thompson, managing director of Arcom Group Inc., which uses technology to help other companies to increase energy efficiency and environmental responsibility, apart from setting up business in China is on a mission to raise the international profile of his native land, which he says is far from famous in China. Jamaican food imprint in Hangzhou, China. “I wanted to introduce Jamaica to China,” said Thompson who moved to the USA as a teen, then completed degrees in architecture and computer science from City College of New York. “Most of the mainland Chinese I spoke to only knew Jamaica as where people who run fast originated. Chinese like to eat and socialize, so I chose food as the first vehicle to introduce Jamaica, and the music is introduced while they eat,” said Thompson one of whose grandfathers migrated from China to British Hong Kong and then on to British Jamaica. He pulled out all stops to ensure a successful launch of his restaurant in China, enlisting the help of another Jamaican, Atlanta caterer Carmen Allen, who travelled to China to help train the employees. AbengNews caught up with Thompson, via email from Chinna: “Restaurants are slow for the first two years and this venture is no different,” he said. 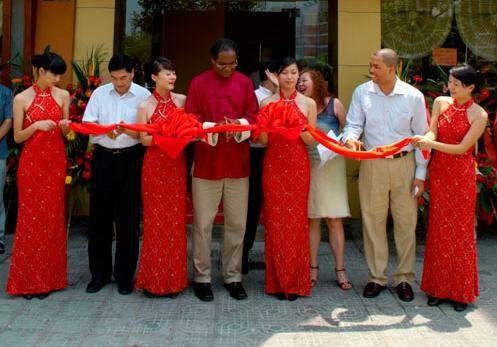 Thompson told us has spread his wings to include an Atlanta-Beijing Chengdu business and culture exchange. Additional information on this is available on the Arcom Group’s web site (www.arcomgroup.net) and he says any company that wants to participate is welcome. After his first trip to China in July 2006, Thompson started a company there called Hangzhou Arcom Investment and Consulting Company, which he says stands ready to provide a bridge and office presence to the small- and mid-sized companies in the Atlanta metro area. The Hangzhou arm of Arcom aims to provide services to reduce air and water pollution in China and provides a cultural bridge for American businesses that want to go into China “toe-first,” Thompson said. His ideas for both the business and the restaurant stemmed from his love for the Chinese people and his desire to integrate two cultures that make up part of his personal heritage. “I wanted to introduce Jamaica to China,” said Thompson . “Most of the mainland Chinese I spoke to only knew Jamaica as where people who run fast originated. At present, he has several business initiatives involving Jamaica in the areas of renewable energy and tourism. He has already imported some evacuated tube solar water heaters into Jamaica and is looking into how the Chinese turn their farm wastes into energy/electricity and plans to invest in that in China and take a working model to Jamaica. He is also the director for Peggy’s Bottom Retreat resort in Jamaica. Ah well, give Cho-Cho some time.